Kanazawa City aims to be an International Cultural City. They used a cotton mill as the base for cultural activities. I made a flag installation in the spaces of the facility. 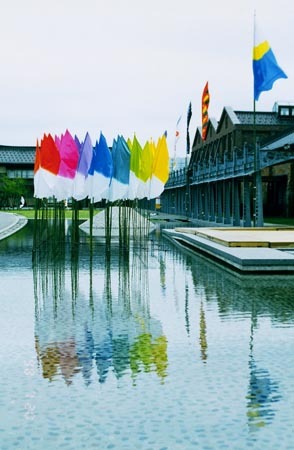 The "rainbow forest" flags are dyed seven different colors and stand close together on the waterside. Sun and Moon flags (representing Light and Shadow) are installed on both the left and right side of the promenade. The colorful flags create an expression by reflecting on the water's surface and swinging in the wind and making a fluttering sound. People walk around in the background behind the flags, sometimes Kaga-Noh is danced on the stage, or there are even Mongolian Matouqin concerts.